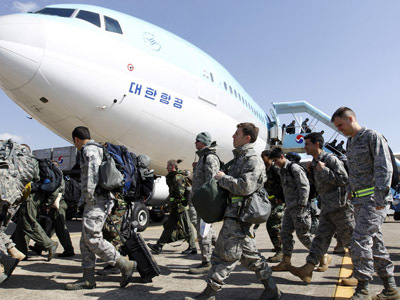 North Korea says it is ready for “total war” with South Korea and the United States, as the two countries commenced mass joint war drills near its border. “We will wipe out the traitors led by [South Korean President] Lee Myung-bak and American imperialists from the South Korean soil,” North Korean Army officer Jon Chol-guk told the media in Pyongyang. The annual Key Resolve drills are always a flashpoint for regional tension. The Korean Peninsula has been divided between two conflicting states for over half a century. 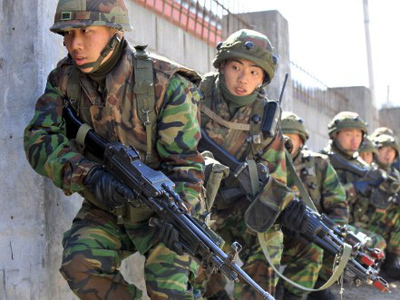 The war games incorporate around 200,000 South Korean troops in co-operation with 2,100 US soldiers. Officials say the drills – which will last until March 9 – are “routine and defense-oriented." This is not how North Korea sees them. “The US imperialists are the sworn enemy keen to launch another war of aggression to impose an ‘American-style political mode’ upon us,” said a statement from KCNA news agency over the weekend, quoting the army leadership. Recently-installed leader Kim-Jong-un has "ordered his troops to make a powerful retaliatory strike at the enemy, should the enemy intrude even 0.001 mm into the waters of the country where its sovereignty is exercised," it reports. 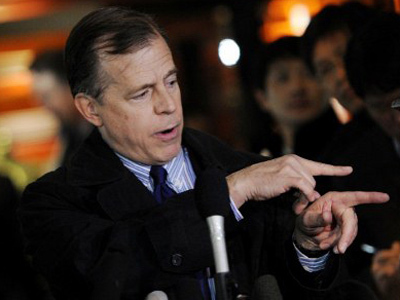 It is not clear whether the North Korean statements serve as a defensive warning or represent belligerent intentions. Western powers continue to worry about North Korea’s nuclear program. North Korea last conducted a military nuclear test in 2009, though it is not widely thought to currently have deployable nuclear weapons. After months of overtures, China-mediated talks aimed at bringing North Korea to the negotiating table on its nuclear program ended with “little progress” last week, according to the US negotiator. But even without nuclear conflict, the high-stakes rhetoric can spill into violence. 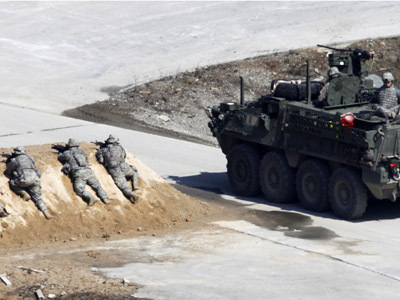 At least 11 people were killed on both sides when the North and South exchanged artillery fire during another exercise conducted by the South Korean army in 2010. Symbolically, Kim-Jong-un recently visited the North Korean battalion involved in the stand-off to congratulate them on their vigilance. A second set of South Korean exercises – involving more than 11,500 troops from the US and other outside NATO states – is set to begin on March 1.